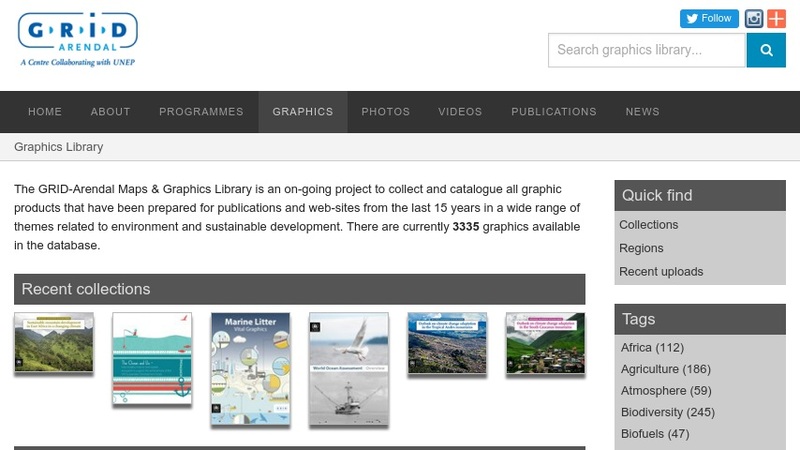 This online library includes all maps and other graphic products on the themes of sustainable development and the environment produced for the United Nations Environment Programme (UNEP) and GRID-Arendal publications and web sites. The collection is organized by theme: freshwater, waste, biodiversity and conservation, environment and security, climate change, and topics. There is also a collection of interactive maps and data covering worldwide statistics by country; a map delineating the continental shelves; and thematic maps of specific regions (the Arctic and Antarctic, the Baltic Sea). The library may be browsed by region, theme, or by collection, or it may be searched by keyword.